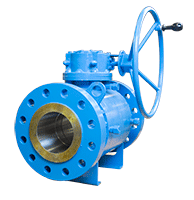 Flo-Tite’s Trunnion Mounted Ball Valves are engineered for heavy duty applications such as natural gas storage, petrochemical plants, power generation, oil refineries, and desalination plants. Our welded body designs are ideal for buried service applications in order to minimize the potential leak points and reduce the potential of fugitive emissions from flanges. Our soft-seated designs provide excellent leak-resistance; top entry valves with a one-piece body design which allow in-line maintenance, and metal-seated valves which provide excellent operation at high temperatures as well as providing abrasion resistance in demanding applications.